Israeli judoka Sagi Muki made history on October 28—coincidentally, World Judo Day—by winning a gold medal in the 81-kilo weight class at the Abu Dhabi Grand Slam. This marked the first time Israeli competitors were permitted to show the Israeli flag on their uniforms and the first time Israel’s national anthem, “Hatikva,” was played in the United Arab Emirates. Muki’s teammates Gili Cohen, Baruch Shmalilov and Timna Nelson Levi won three bronze medals earlier in the Grand Slam, and Peter Paltchik won a gold medal in the under 100-kg weight class. Muki, 26, won a gold medal in the 2018 European Championship in Judo last April. In another landmark development on World Judo Day in Abu Dhabi, Israeli Minister of Sports and Culture Miri Regev and Israel Judo Association President Moshe Ponte signed an agreement to bring an IJF World Judo Tour event to Israel for the first time. The Tel Aviv Grand Prix will take place in January and a second Grand Prix is set for 2020. Israel’s progress is self-evident. This Middle-Eastern country is located in the center of three continents: Europe, Asia and Africa. Interestingly, Israeli athletes compete in Europe, in Asia, and in Africa as well. We may call it a country without a continent. But that should not surprise us, because Israel, according to the prophetic Word, is destined to be the leader of planet earth. 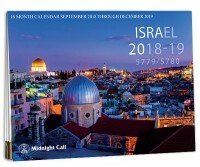 #9078 - 16 Month Calendar: September 2018 through December 2019 - Beautiful, full-color pictures of the Holy Land for each month - Room for important notes - Jewish days and months, as well as holidays - A perfect gift for all who love Israel!